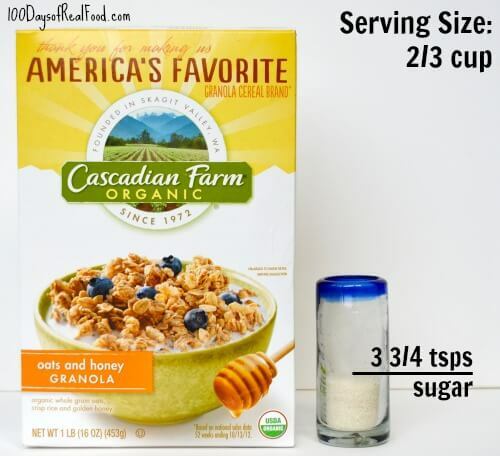 8 Organic Products with More Sugar Than You Think! 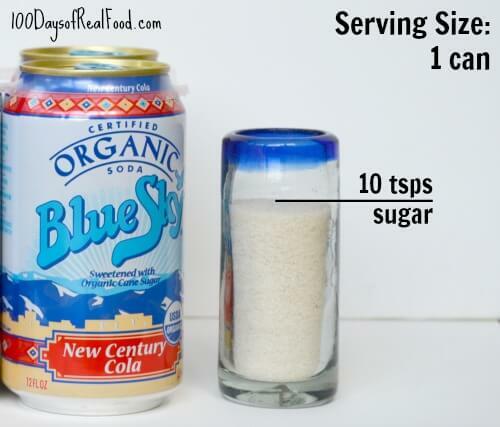 Home » Blog » 8 Organic Products with More Sugar Than You Think! You asked for more surprising products with “More Sugar Than You Think” …so here they are! Below is a list of 8 organic items that would add up fast, sugar-wise. To see why I have an issue with so much sugar and to also find out the difference between naturally occurring, added, and artificial sweeteners (big difference!) be sure to check out my first post in this series. 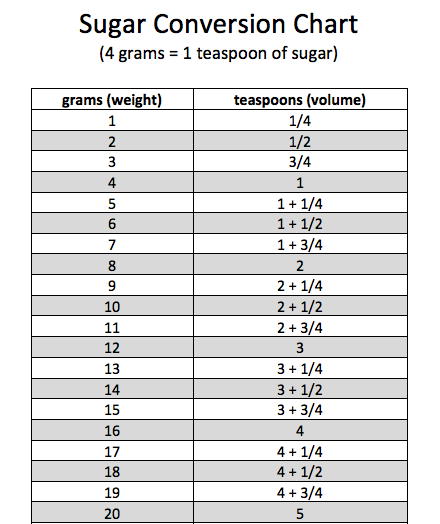 But just to quickly recap, here is the recommended daily allowance of sugar, and also at the bottom of this post I’ve shared a chart that shows you how I calculated the number of teaspoons in the products below. Sure these are a step up from Pop Tarts, but they are still not what I would recommend for a balanced breakfast (or snack)! 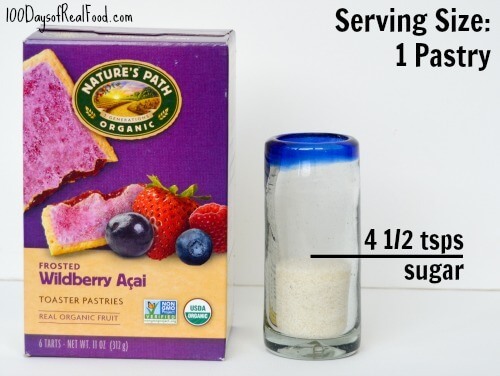 There’s no way to know at this time how much of the 4 1/2 teaspoons is added sugar versus naturally occurring sugar (from the fruit), but take one look at all that icing and sprinkles on top and you’ll know the answer is probably not a good one. How about some fresh berries (and maybe whole-grain toast) for breakfast instead? Were you surprised by any of these examples? I’d love to hear your thoughts in the comments below! 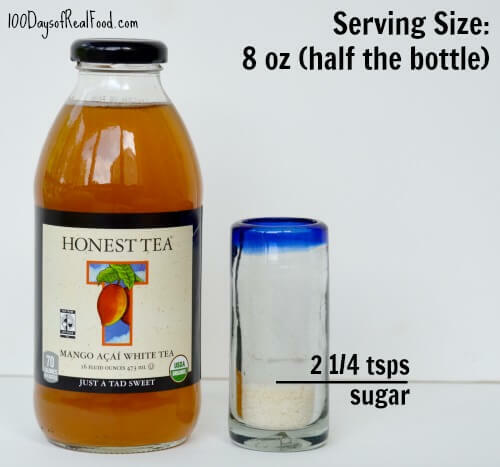 8 (More) Products With More Sugar Than You Think! Avoid processes foods as much as possible. Period. Simple answer. If it’s in a box, the label is probably lying to you as much as it can! I’m not surprised by this, especially after reading your book. Sugar is everywhere and I’ve decided it means all out war in my own life. A few weeks ago, I cut out sugar from my diet. I will add this was a monumental decision because I’m fiercely and dangerously addicted to sugar. I’ve known for years that too much sugar was bad for me, but wow! . . . I had no idea how much I was really ingesting in processed foods. It’s been 3 weeks now since my husband I have been eating ‘read food’. I’ve stopped drinking coffee – because I can’t drink it without lots of sugar and milk (frothed I might add). Now, it’s tea in the morning with a tsp of wonderfully light, sweet local honey from bees that are producing about 8 miles from my house. Delicious and satisfying. I don’t have ANY cravings anymore and realized that my afternoon droop was not because I need coffee, but sugar. Real food is so satisfying, delicious and healthy I could kick myself for waiting so long. Your book explains in so well and is convicting (in a good way). A real incentive to get this thing going. I’m not overweight (only weigh 112 pounds) and I’ve been thin my whole life, but after menopause (I’ll be 60 in November) I added about 5 pounds around my middle (it’s terrible). I’ve been carrying it around for 5 years now and I’m happy to say that 5 pounds of fat have literally fallen off of me. I like to think of it as a 5 pound bag of sugar. Beautiful picture! Anyway, sorry I’m writing so much, but wanted you to know we are on our way to eating real food for life. Grateful! Organic soda makes about as much sense as organic tobacco. As for “organic toaster pastries,” I’d rather have conventionally raised whole fruits and veggies any day. Wow! Thank you for this and your post, Dixie. I am 39, a dedicated runner and have also been thin all my life but I am bummed by my recent thickening around the middle. I know sugar is a major culprit with me. Dixie, your post has encouraged me to work harder to eliminate sugar. I am a breast cancer survivor, too, and I will never forget my PET/CT scan when I was injected with radioactive sugar water dye. I was told this is because cancer craves sugar and metabolizes it quickly, so cancer would quickly be detectable on the scan (luckily for me, it was limited to one breast and some lymph nodes). If that doesn’t scare us into eliminating this toxic stuff, what will? All the best, Real Foodies! I LOVE that “Cascadian Farm” Oat and Honey Granola cereal! I tell my husband it is my organic “crack”; it is proof that too much of a good thing can be a bad thing. When I’m not eating it by the handfuls straight from the box, I mix it with a “Stonyfield Farms” Organic Greek Lemon Yogurt instead of milk. It is my favorite breakfast right now. Great post, thank you so much! I’m so tired of the hidden sugars in food like spaghetti sauce, etc. I do think I give organic foods the “pass” and don’t pay enough attention to the sugar content, but now I will start! I think you should have also had organic flavored yogurt on here, besides spaghetti sauce. Each has crazy amounts of sugar in it! I have to admit those organic toaster pastries look delicious! lol. (they are, i’ve had them!) I have been 95% processed sugar-free for a few months now (I enjoy a treat from time to time) and it helped me lose the last 10lbs of baby weight I was holding on to (even with working out and eating healthy) The elimination of sugar did the trick. Sadly I still crave it. I have greater will-power now though, seeing the results. 31 bunnies sounds like a lot for a serving size! then again I have a 2yr old and a 4yr old! Ever thing we eat or drink should be marked clearly. If it has sugar added or whatever should be marked. Products like yours have made America and the World obese. We should start Lawsuit against products that don’t do this. 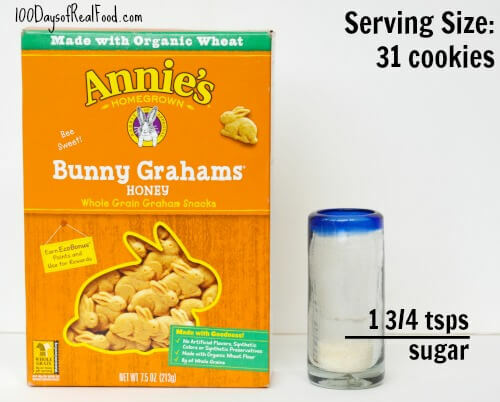 My mother-in-law just bought a huge box of bunny crackers at Costco, thinking she was helping us with eating real food, and I was shocked to see how much sugar was in each little bag. It was hard telling her these were special treats and not going to be regular snacks. Great reminder, Lisa! I come across this all the time. People just assume that since the label says “organic,” it’s okay to eat it. Yes, it’s much better than the non-organic version (usually)…but it’s still junk food and should be eaten in moderation. I will admit, there are a few of the foods above that I have purchased for my kids from time to time…and I know it’s still processed food…but, for the occasional treat, I’m okay with it. It’s still a good reminder for me (and everyone else) that these treats may be organic, but it doesn’t mean we should load up our carts with them! I really enjoy reading your posts. My husband and I have been eating healthier for a while now but sadly we have not been able to go 100% real food yet. I have been researching and learning for months now so that I know what my husband and I are putting in our bodies. It can be a bit overwhelming at times when you think you have prepared a healthy meal only to find out the next day that an ingredient isn’t as healthy as you thought. I am currently reading your book and it is nice to have so much information in one place that I can reference back to. Thank you for sharing everything you know. This is great info but what would be even more helpful would be a side by side of similar non-organic products. Would the organic options, while not perfect, be better, worse or the same as the name brand non organics that the consumer may have bought the organic to replace? This post was really helpful! I am new to 100 Days of Real Food and have been starting to phase out other foods. I have some of these organic sugar offenders as snacks for my daughter. While I was pleased they are organic, one bar equaling her daily sugar recommendation is just unacceptable! I just made some of the carrot/applesauce muffins and I have a feeling I will have no trouble replacing her sugary stuff with these and other great options! We are hooked!! Thank you! I thought it was a good thing when I discovered kidz bars this year, now not so much. My grandson is very picky and his school is nut free. Organic may mean better ingredients, but it doesn’t mean sugar-free. Thank you for bringing these foods to our attention. Fruits and veggies! I give them to my son regularly, but he won’t eat them! ACK! Two of my regular school snack items are on this list! We are in a nut-free classroom, and it has to be non-messy and able to be eaten with one hand. Cheese sticks are “embarrassing” and “gross because they get warm” (the teacher wants the snack pulled out of the lunchbox at the beginning of the day to minimize later disruptions). All the rest of the kids are doing Doritos and Cheezits. Ideas? I have made diy cheese crisps before and they were surprisingly easy. The recipe was in my weight watchers cookbook but basically you mix shredded cheese of choice with a few other ingredients & drop in little spoonfuls on a baking sheet. They’re pretty tasty & your child could pick what flavor cheese they want. How do you know if the sugars listed on the nutrition facts are naturally occurring or added? Thanks. Do you have a recipe for BBQ sauce? I didn’t see one in your recipe index and I would love to be able to make it at home. My boyfriend can’t stop eating that Sweet Baby Ray’s crap. 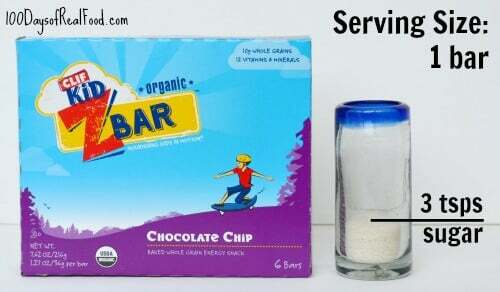 Many Lara Bars have twice the amount of sugar as the clif z bars and are not organic. While the sugar in Lara Bars come from dates, I still find the amount is too much for a child to have regularly. I guess it’s a personal choice, but I find nothing wrong with organic cane sugar in small amounts. I could be wrong because its been awhile since I read the ingredients but the kidz bars are sweetened mainly with figs? That would similar to the dried fruit which is basically condensed to sugar. Hm… how helpful is this? You start out talking about added sugars, but then evaluate each product based on the reported total grams of sugars–not on the amount of added sugars. The Z-bars in particular do show organic cane syrup in the ingredients and 11g sugars in the nutritional info… and the suggested Lara Bars (I chose the Cherry Pie flavor) have 23g sugars, more than double, in their nutritional info. Is a bar with all of the sugars coming from fruit really nutritionally better? I don’t know the answer but am not convinced with this. Ugh I buy a few of these items regularly! Will need to change that to just occasional purchases. Thanks for the info! I’m aghast at the added sugar in yogurt. A cup of Whole Milk Plain Stonyfield Organic yogurt has 12 grams of sugar. The Whole Milk French Vanilla has 30 grams of sugar, meaning that it has 4.5 additional teaspoons of sugar per cup vs. the Plain! My problem is that my kids only like the vanilla. I’m trying to wean them off it and over to the plain, but it is going to be a long, slow process. I had the same problem, but now my kids are happy with the plain yogurt mixed up with a spoonful of honey. Yes it’s still sweetened, bit it’s a natural sweetener & we can control how much goes in. 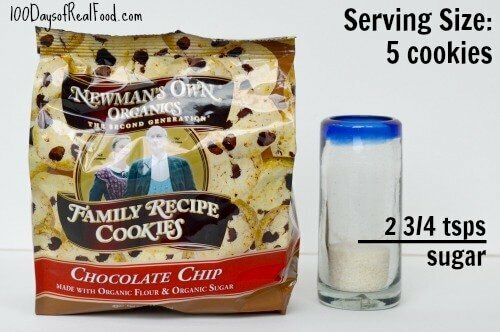 Your muffins have two teaspoons per muffin- do you not allow any other sugar if they have had one? Wow, yes I was! I haven’t really ever considered how much added sugar I was max supposed to have in a day so to see that listed and then to see some pretty normal lookin foods containing a chunk of that amount was surprising. I don’t drink soda or sweetened tea of any kind but my husband does and we were both shocked at the amount of sugar in the soda. Yuck yuck yuck!! Thank you for posting this. I wish this compared the products with similar non organic. I do watch sugar intake my main thing to avoid is high fructose corn syrup. I will spend extra to buy products without it. Google the effect of HFCS on the body. Yikes, I just bought that barbecue sauce and my husband drinks and Honest Tea almost every day! Eye opening! I think the Z Bars are the only thing on this list I’ve purchased, and I’m not shocked, but disappointed. My very picky 8 year old often requests these for school snack. I usually pack a container of fresh fruit such as grapes, strawberries or apple slices and then squeeze a bar or pretzels on top. I’m quite sure if I only sent the fruit, he would complain that it’s not enough. His class is one of the last in the school to eat lunch, so he needs something to get him through the morning. I figured a protein bar along with the fruit was better than the Doritios or powdered donuts he claims his classmates bring. I wish he’d go for the oatmeal you’ve mentioned your girls take, but we’ve tried this at home (several times!) and it’s a no go. I think a post on healthy, packable, teacher/school approved snacks would be super helpful to most parents who read your blog. forgive me if you’ve already done this. Like another reader mentioned, ours has to be something safe at room temp and not too messy. Our preschool snacks are a whole other ball of wax…we are a nut-free preferred environment, and one of our classrooms is also dairy free due to extreme allergies. Help! I also got suckered into buying the organic cereal for a while, until I noticed it had more sugar than fruit loops!!! What??? I am new to 100 days and on a mission to eat healthier. We still have pop in our house so we have a long way to go. It can feel so overwhelming trying to eat “healthy”. I too was sucked into the organic is better for a few years and all I really got was a box of really expensive sugar and sometimes other chemicals. I’ve started experimenting with making my own snacks http://www.aimforhealthybites.com/incorporating-healthy-eating-while-traveling/ but with limited time, still rely on some of the processed foods. If you like pop because of the carbonation you can try sparking flavored water. I’ve made the switch and I love the water. Dasani makes one and La Croix has a lot of different flavors. They have no sweeteners of any kind so its an adjustment when you used to the sweetness of pop. Water kefir is a great option as well. I definitely got suckered into the low-fat cream of the pathâ€¦ Taking it way too much sugar and added sugar. Because I’m a visual person, I would add to your chart that the AHA recommendations are for added sugar, not total sugar consumption. I know this myself, having checked the AHA websiteâ€¦ And having checked my daily intake on MyFitnessPal. Two fruit servings and one glass of milk later, I’m at or over the limit! Having no added sugarâ€¦ anyway, once I calculated my added sugar for the day, I was right on target thanks to eating real food and following your blog! Just because something is labeled organic, it doesn’t necessarily mean it’s healthy. That organic soda is enough to kill you! I’m sure that the carbohydrate count would play a role in insulin production as well. People think just because it might be raw organic it’s healthy but as we’re learning health is more than a label. Annie’s just announced on their facebook page, they are partnering with General Mills, for those who don’t like voting with your dollar for the larger corporations. Can you share your recipe for granola cereal? Organic means it is not made with pesticide-sprayed products (pesticides cause cancer, birth defects and many other disorders and diseases). However there are different levels of organic that I was studying just this morning. I would still rather eat sugar-fied organic products than non-organic ones; at least I know where the ingredients have been. The non-organic products seem to contain more chemical additives and non-natural ingredients. It all comes down to reading the label, eating the serving size and buying products with the fewest ingredients as possible. And not over-doing anything. Yes, junk food, organic or not, is bad in large doses! It similar to a “vegetarian” who only eats, bread, pasta, and cheese sauce. That is not a healthy diet. Moderation and diversity will help build a healthy diet. Depending on what they were eating before, it may still be a better choice. Don’t be too hard on yourself. More like 2 steps forward, one step back. Just a friendly reminder: an organic granola bar is like eating a homemade cookie in terms of sugar. So to eat healthier we need to stop eating cookies at every meal or for in between snacks. Fruit is really your best bet but when on the road ( I’m a visiting nurse) at work or with the kids fresh fruit doesn’t always work so a jr clif or Lara bar will do. I wasn’t really that surprised by this list as I have found that just because the box says “organic” doesn’t mean good for you…watch that Organic Sugar! However, I have another take on the z-bars. I include them in my kid’s lunches pretty much everyday…however, we are fairly new to whole foods and my kids are making huge changes in their diets and making much healthier choices over all. The Z-bars are WAY better than what they had before, so even though they have added sugar, I will continue giving them for now…Aside from the Z-bars they take fresh fruit, Sandwich/grain (whole food versions), and water. sometimes adding in veggies or olives. what do you think of the KIND brand bars? Just the simple fruit and nut version? Hi Sarah. I am a fan of kind bars. They aren’t perfect but they are far better than most and are fairly low in sugar. I definitely love these posts especially about the organic not necessarily being “good” for you. One thing I would like your opinion on is – my husband is a type one diabetic and he often needs sugar if his sugars are low. He often just drinks some Gatorade because of the fast acting sugar results (which I know is often looked at as negative but in his case, he needs the sugar). Anyway, what do you think are some of the best options for a higher sugar drink? I really want to replace the Gatorade with something better for him but honestly it’s the easiest in a pinch especially since it comes in powder form. I haven’t been able to find a good substitute-thought? 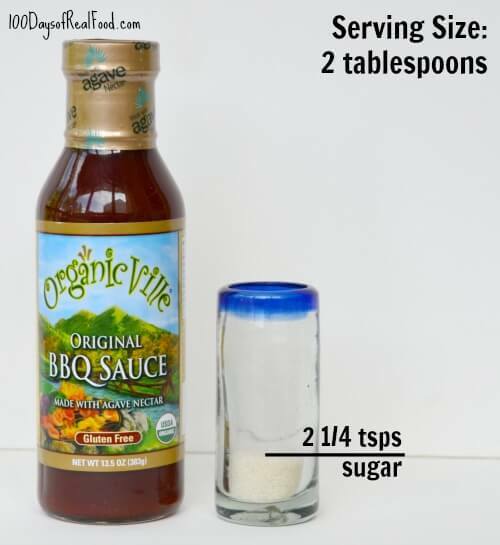 I have a couple of friends who are type 1 and they say to just put a bit of real sugar in a glass of water – it sounds bad…but, if they need the sugar this is a good way to get it in without all of the other crap. :) Another thing they do is a piece of candy…again, not great…but, you gotta get the sugar in. Good luck. My husband is T1 as well. He keeps organic GoGo SqueeZ or Plum Organics pouches in his car, in the fridge, etc. for emergencies. Might be for children but they are absorbed pretty quickly into his blood sugar and nicely portable. Good luck, I know it’s a struggle. My daughter has a peanut/ tree nut allergy what is a good granola bar alternative? Low sugar varieties are hard to find without nuts. I buy Kind brand Oats & Honey bars as a nut-free sometimes option. They do have (non-GMO) canola oil and a couple other things that aren’t ideal “real” food and they have 7g (1 3/4 tsp) sugar. They are made in a facilty that uses peanuts and tree nuts, so depending on the allergy, they may not work. None of this surprised me. Sugar is omnipresent and addictive…and requires diligence to avoid it. I am wondering about foods like Lara bars that have 15 -18 g of sugar. Do these not count because the sugar is coming from a natural source in the dates? Hi there Jody. Well, it still counts as sugars you are consuming but not as added sugars. Hi there. This will help: https://www.100daysofrealfood.com/2015/07/29/snack-bars-real-food-or-really-unhealthy/.